It was August and it was hot, yet modesty standards of 1901 dictated that men wear jackets and women don ankle length skirts with layers of petticoats underneath. However, the heat wasn’t enough to deter the large crowds who had come to witness a balloon exhibition given by famous aeronaut, Leslie Haddock, but as the balloon rose into the evening sky, it quickly became apparent that something had gone terribly wrong. Silver Lake is a body of water that lies in the approximate geographical center of the town of Bellingham, Massachusetts. 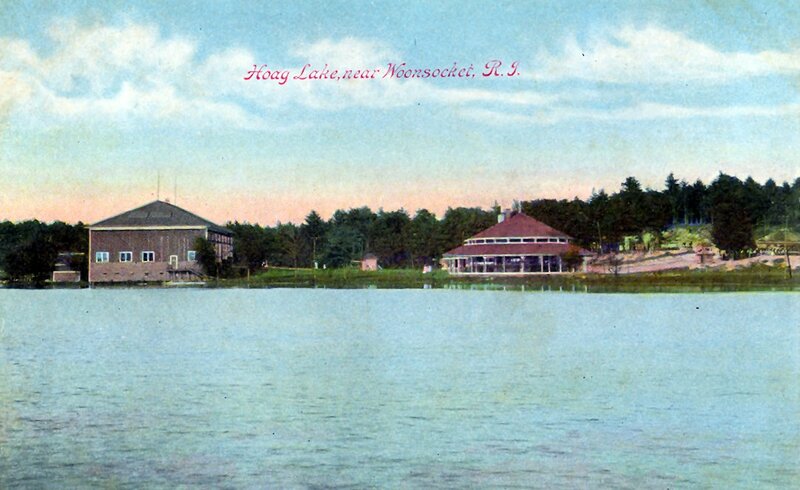 At the dawn of the 20th century it was known as Hoag Lake, and was a popular tourist destination due to an amusement park located along its shores. The park was owned and operated by the Milford, Attleboro, & Woonsocket Street Railway Company, and it cost a nickel to ride the street car to get there. Besides a large carousel and other rides, the park boasted a restaurant, a dance hall, a theatre, a beach, outdoor concerts, boat rentals, live animal acts, and the occasional balloon exhibition. 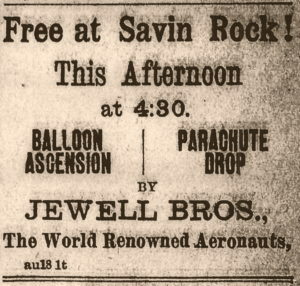 One such exhibition was scheduled for the third week of August of 1901, to be performed by a man named Leslie Haddock, a well known aeronaut in his day and no stranger to hair raising experiences. He arrived on Monday, August 19th, and began his exhibition by making two ascensions that day, much to the delight of the cheering crowds. The balloon continued dropping near the boat house and the crowd began running towards the shore to get a better look. When the craft was twenty feet from the water Haddock leaped over the side and dropped into the lake making a dramatic splash. The balloon, now relieved of its weight of human cargo, suddenly rose upward and drifted away; the glowing flare still indicating its position in the dark sky. Looking out over the lake there was no sign of Haddock. Had he drowned? Should someone jump in and try to save him? A murmur swept through the crowd as this was debated, followed by a sigh of relief when Haddock’s head suddenly bobbed to the surface. He waded ashore to the thunderous applause of the happy spectators who now had an exciting story to tell when they got home. 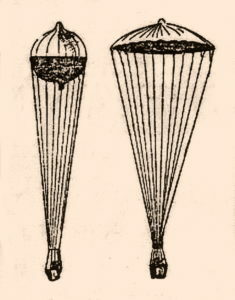 Haddock later explained that the accident was due to a sudden tear in the upper portion of the balloon which had allowed the gas to escape, and supposed the fabric had failed due to age. He went on to say that he had been worried about the craft’s air-worthiness, and had taken a parachute along as a precaution, but never had the chance to use it. 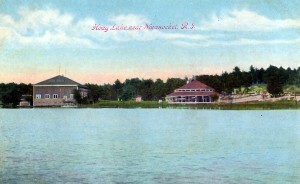 Hoag Park remained in operation until 1922, when the property was sold to new owners. The decline in trolley car use seems to have been a factor. Unfortunately, the new owners were unable to bring the place back to its former glory, and over time the park simply faded into history. This wouldn’t be the last adventure Mr. Haddock would have in a balloon. Several years later in July of 1908, he took part in a balloon race in Chicago where his entry, the 87,000 cubic foot Cincinnati, became entangled in electrical wires upon take-off. 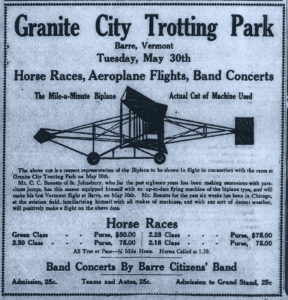 An advertisement in the Morning Journal and Courier of New Haven, Connecticut, stated a fair would be held in Stafford Springs on October 16 and 17. The following article appeared different newspapers around the country. A exciting incident took place in connection with the balloon ascension at Stafford Springs, Conn., last week. “Professor Hogan, the parachute “artist” who had been engaged to make a balloon ascension, had waited all day for the wind to die down. 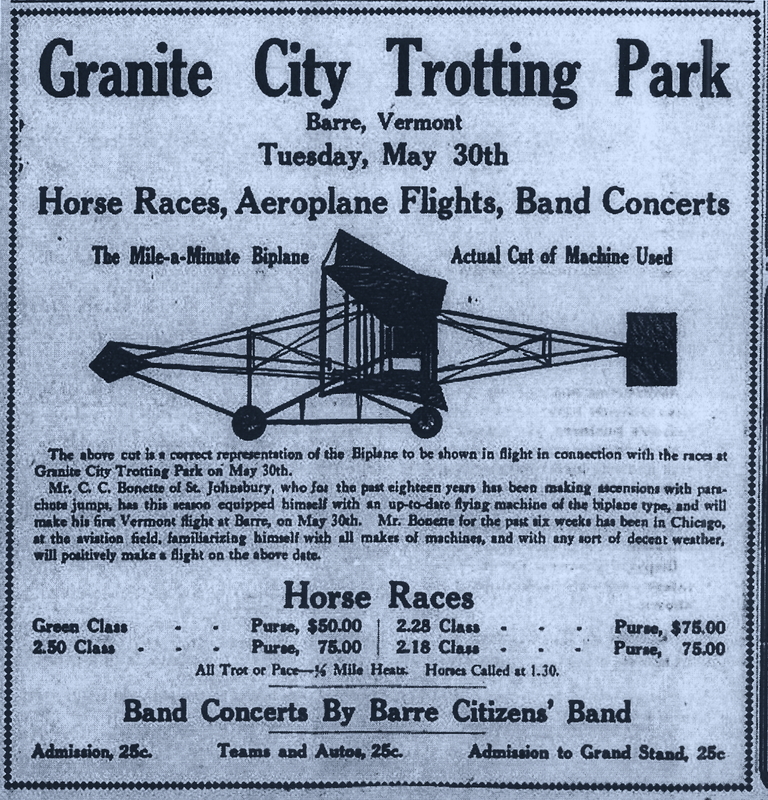 About 5:30 o’clock, before 3,000 spectators, he inflated his monster machine and ascended gradually to a height of 4,000 feet, or nearly a mile. At that enormous height the balloon with its occupant appeared to be about the size of a frog. 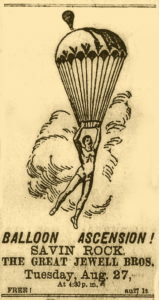 According to his programme, the aeronaut at this point fixed his balloon so that it would fall to earth alone, and prepared to make his daring descent by means of the parachute which was attached to the side of the balloon by a small cord. 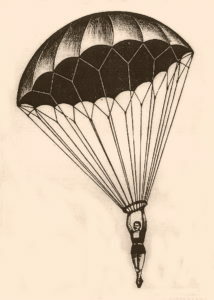 The parachute, when inflated, is a sort of cone shape, the base of which looks like an umbrella, the sides being numerous cords and the apex being a small iron ring, to which the Professor hangs by the hand. Mr. Hogan jumped from the basket at that terrible altitude with the iron ring in his hand. The cord attaching the chute to the balloon at once broke, leaving the dare-devil with his flimsy apparatus nearly a mile from earth. A terrible thing now happened. The cords had become entangled and stiffened by the rain, and prevented the great chute from expanding it broad surface in the air, through which the aeronaut was now falling with frightful speed. The people below, looking up with wide-open mouths, could see nothing but a dark line becoming longer at each instant, and coming toward the earth with the speed of lightning. “My God,” cried a looker-on, “Hogan’s gone.” A woman clutched frantically a strange man at her side as the body in the air was seen to careen to one side as if unstable. At this point, when fully one-half of the descent had been made in but a few seconds, and when not one of the 3,000 spectators expected aught else but a catastrophe, the great surface of the chute was seen to expand and thence there was only a graceful, easy fall that turned every groan into a smile. When the performer reached the ground he said that at the beginning of the descent he realized his danger, but could do absolutely nothing but clutch the ring. He was unable to breathe, his head began to swim, faintness overtook him, and his sensation was that his fingers were relaxing their hold. At this point, however, the entangled cords that held in-closed the folds of the chute were snapped by the enormous pressure of the air, and he was saved from certain death. In January of 1872, famous aeronaut and balloonist Samuel A. King, (1828 – 1914), of Boston, began constructing what would be, when completed, “the largest balloon ever made in America”. The name of the balloon was to be “Colossus”. The balloon, it was reported, would have a circumference of 191 feet, with a capacity to hold 100,000 cubic feet of hydrogen gas. It would require 1,200 yards of Lyman cloth to make, which would be custom manufactured for this specific purpose. To give the balloon added strength, twenty-four bands of four-thickness cloth would encircle the sphere. The entire balloon would be coated with an oil based varnish to make it air tight in order to prevent the massive amount of gas from wicking out through the fabric. The pilot and passengers would be carried in two custom made cars suspended beneath the balloon, with one car situated above the other. The upper car would be smaller than the lower one. The top car would carry scientific instruments and passengers, while the lower one more passengers and ballast. The entire balloon, empty, would reportedly weigh between 1,400 and 1,500 pounds, and when fully inflated would have a lifting capacity of 7,000 pounds, which could equate to fifteen or twenty passengers. It was expected that the Colossus would be completed in time for its scheduled inaugural launch from the Boston Common as part of the city’s Fourth of July celebration. Construction would take place at Mr. King’s residence and workshop located at 179 Chelsea Street in Chelsea, Massachusetts. 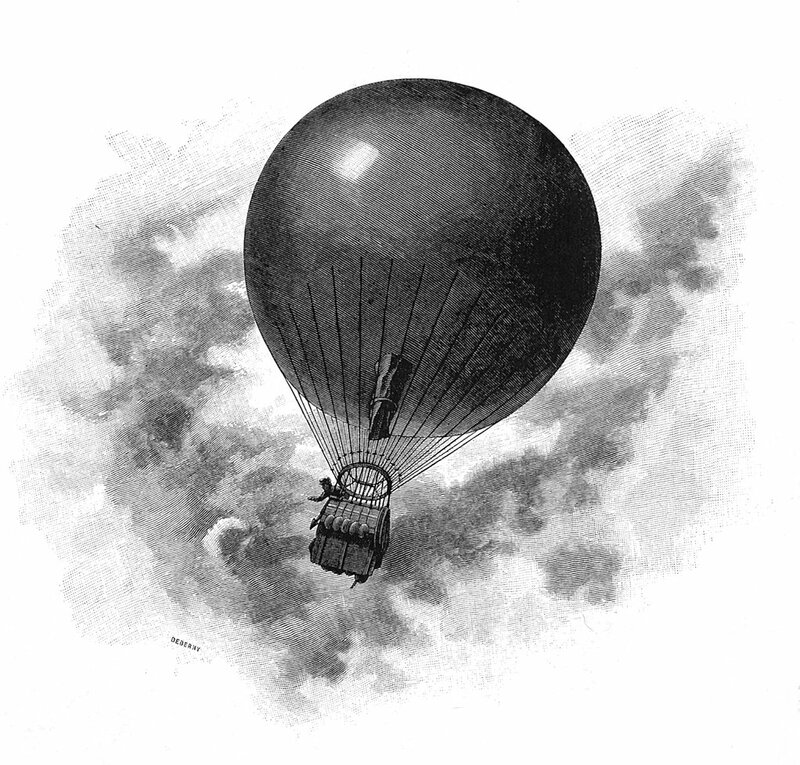 On June 6, 1872, as the balloon was nearing completion, it was seriously damaged by fire. Portions of the balloon fabric had been spread out on a vacant lot between Chelsea and Watts Streets where it had received the first of four coats of the oil-varnish. As the fabric was left to dry, a storm approached, so workmen carefully rolled it up to prevent moisture damage. At some point after the storm had passed, the fabric was unrolled, at which time sections were found to be on fire due to spontaneous combustion caused by solvents in the oil-varnish. Professor King was away in Philadelphia at the time making arrangements for the completion of one of the passenger carrying baskets, and was notified of the setback by telegraph. Fortunately the balloon was salvaged, and repairs completed in time for it’s anticipated ascension from the Boston Common on July 4th. On that day thousands came to watch the event. This was to be Professor King’s 164th balloon ascension, and he was going to take twelve passengers with him on this historic flight. “In my judgement,” King told a reporter, “although you can’t depend much on the weather, we will find ourselves about ten o’clock to-night somewhere up in the mountains of New Hampshire.” His comment about the unpredictability of the weather would prove to be prophetic. Most of the twelve passengers were newspaper men, but at least one was a scientist from Washington, D.C., who planned to record atmospheric conditions with scientific equipment. While the balloon was being inflated on the Common, at least four citizens approached King with cash offers if he’d take them along on the flight, but all were refused. Fortunately there were no reported injuries due to the explosion. The Daily Dispatch, (Richmond, VA.) “A Colossal Balloon”, (Copied from the Boston Advertiser, May 23, 1872. The Tiffin Tribune, (Tiffin, Ohio), “The Largest Balloon In The World Ruined By Spontaneous Combustion”, (Copied from the Boston Advertiser), June 20, 1872. 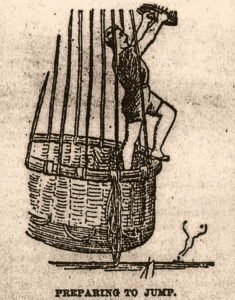 Since the first manned balloon ascensions in the late 1700s, aeronauts had been envisioning a time when it would be possible to cross the Atlantic Ocean by air. 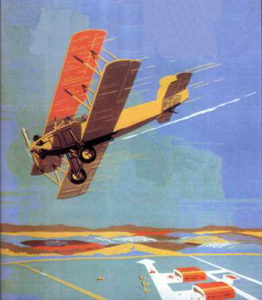 With the advent of mechanical flight in the early 1900s it was thought that aviation technology might have reached a point where such a crossing might be possible. The following article appeared in the Evening Star, a defunct Washington, D.C. newspaper, on October 20, 1910. It illustrates why crossing the ocean was easier said than done, and mentions aeronaut Washington Donaldson, and his unexpected trip to New England. Flight Across Atlantic Hope of Many Persons. 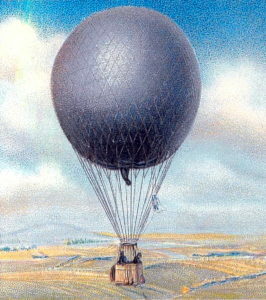 For the last seventy years there have been numerous projects for crossing the Atlantic Ocean by means of a balloon, but, while several of those engaged in the enterprises expended considerable money in making preparations , only one balloon before that of the Wellman expedition actually made a start. 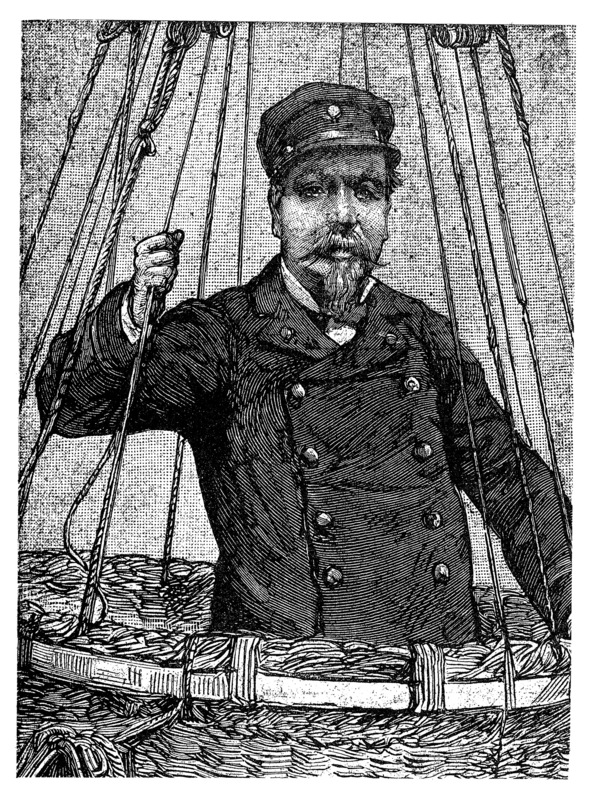 Strange as it may appear, the first idea of crossing the Atlantic by means of the old-fashioned spherical balloon came from England, but from such information as is now common property regarding the upper air currents generally blowing over the North Atlantic, such an expedition would be impossible in all but a reversal of conditions, which, in the law of averages, is not likely to happen more than once in ten thousand times. 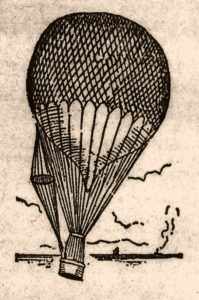 In a spherical balloon it was recognized after John Wise, a Philadelphia aeronaut, published his studies in the 1840s, that a voyage across the sea from east to west, while not impossible under conditions that were hardly to arise at the psychological moment, was so unlikely to meet with those conditions that it was improbable. It was in the year 1840 that Charles Green, a daring English aeronaut, outlined his proposals for crossing the ocean. Mr. Green offered his services gratuitously if some wealthy persons would finance the project. These patrons of ballooning, however, failed to come forward in the requisite number, and the project went to join the great limbo of great things undone. Green’s idea, briefly, was to jockey for the right currents of air. He intended to rise up to meet the current that would carry him in the chosen direction, or would descend to the stratum that would do so. Such a plan necessitated an enormous quantity of ballast, and it was pointed out by Tissandler and others that the experienced aeronaut did not, perhaps, count sufficiently on the loss of gas that would follow such a proceeding. They also showed that by making this attempt the balloon could not possibly have the buoyancy necessary for so long a voyage. There seems to be no doubt that Green’s project gave the initiative to John Wise, for in the year 1843 he published his plan for making the voyage across the Atlantic, and having asserted the existence of an almost constantly prevalent wind blowing toward the east, received more attention than such daring projects usually gain. In an announcement directed “to all publishers of newspapers on the globe,” Mr. Wise told of his intention to cross the Atlantic in the summer of the following year. 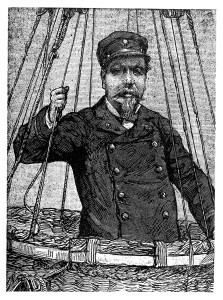 The announcement asked the commanders of seagoing vessels to be on the lookout for him and his balloon, and he admitted that the expedition was daring and dangerous and it success only problematical. It was thirty years afterward before the dream seemed to be on the eve of realization, and at the time when the big airship was being manufactured and arrangements made for the actual voyage, Wise published another book, in which he explained that the trial had not been attempted sooner because of the failure to receive the financial assistance that such an expedition entailed. While Wise did not make the voyage in the summer of the year 1844, as he had announced, about that time there appeared in the New York Sun a most wonderful account of a voyage of Monc Mason, Harrison Ainsworth, and one or two others. This was the now celebrated balloon hoax, written by Poe, and, with the announcement of Wise still in their ears, it required no serious difficulty to make the majority of persons believe that a voyage by balloon across the Atlantic actually had succeeded. In a day or two the hoax became evident, and even now the story is read with interest because it was constructed on such probable lines that only Jules Verne, in a later time, has succeeded in giving so marvelous a tale. In the fall of the year 1873 the great balloon that had been designed by Wise was being made ready for the start in Brooklyn. Wise was to be the chief of the expedition, and his lieutenant was to be the daring aeronaut and circus acrobat, Washington H. Donaldson. The balloon followed closely the pattern Wise had advanced thirty years before. It was not, however, quite so extensive. The balloon was said to have a lifting power of 14,000 pounds, and sufficient carrying capacity to permit about 7,000 pounds of ballast and passengers and freight being taken. In addition to the main aerostat, there was a smaller one, which was intended to supply gas when the main gasbag should need repletion, and when it had been exhausted in this manner it was the intention to cut it up for ballast. Hanging below the balloon was a car of two stories in height, in which the passengers, food, and ballast were stowed. Below this there was a boat weighing 800 pounds, which was to be used in emergency. Wise already had used a boat under his balloon in his historic voyage across lake Erie, when he was carried along with a hurricane that was terrifying in its violence. The lower room in the car was taken up with ballast and with a windlass to lower and take up the drag rope, which weighed about 600 pounds. The boat was divided into airtight compartments, and was believed to be practically unsinkable. Provisions and water for the party for thirty days were taken in. After the great balloon had been taken to the ground in Brooklyn where it was to be inflated a series of disappointments beset Wise. It seemed to be impossible to inflate the huge gasbag. Several ineffectual attempts were made, and then Samuel A. King, another Philadelphia aeronaut, now the nestor of the whole profession, being in his eighty-third year, was called in, and he succeeded in inflating the aerostat with the hydrogen gas. It was about this time that a disagreement arose between Wise and others connected to the enterprise. 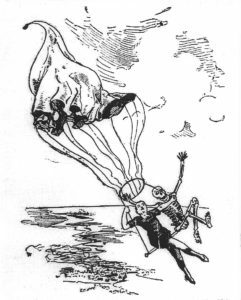 This result, Mr. king always had predicted, would be the end of Wise’s connection with the project, and in the end the balloon was placed in charge of Donaldson, who, while regarded as the most daredevil man who ever went aloft in a balloon, had had so little experience with ballooning that it was said he never would succeed in making the voyage. There was a fierce gale blowing toward the east when, on the morning of October 6, 1873, the balloon with the expedition on board was cut loose and swiftly sailed toward Europe. The balloon soon rounded the eastern end of Long Island, where a contrary current of wind changed her course to the north , and the huge aerostat was hurriedly carried over the New England states. Its farthest northern point was in Massachusetts, when another current caught it and bore it back again. Finally the balloon came down and its passengers made a landing safely, in a terrible storm, after a voyage of about 500 miles. There were several French projects afterward, but some of these were not balloon projects, but airships, that had not been actually made, but designed. One of the most interesting of these was a steam airship designed by Nadar, which, although using planes for supporting surfaces, made its ascent or descent by means of a series of vertical screws, the principle which now is being studied in the helicopter designs of airships. In the winter of the year 1879 Samuel A. King put into practice his long cherished project of attempting to cross the Atlantic, and it may be said that while that failed he still believes in its possibility. A syndicate built two giant aerostats, and they were established in a station on Manhattan Beach. The balloons had each an ascensive force of about 10,000 pounds, and figuring on green’s studies, Mr. king expected to be able to stay in the air long enough to jockey the balloon across the ocean. The studies, however, showed that there were still some things to be learned. While wireless telegraphing had not been discovered at that time, telephony had not only been invented, but was in a small way actually in use in the larger cities, and Mr. King’s balloon had arranged to make use of this new invention: but this, it should be stated, was only used while the balloons were used as captives at the observing station on Manhattan Beach. They could have no use at sea. Some hitch occurred before the time for the starting of the expedition arrived, and Mr. King never made his attempt. This was the withdrawal of the backers according to Mr. King. 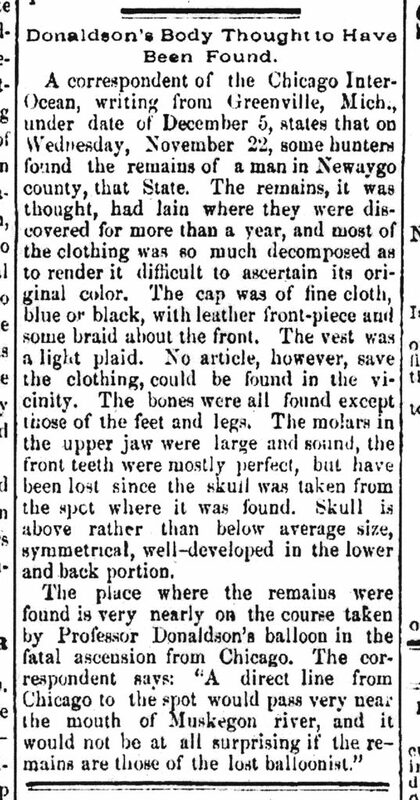 The following newspaper article appeared in the Washington Standard, (Olympia, Washington), on May 18, 1894. It is unclear what results, if any, were learned from this experiment, which appears to be the first ever of its kind. Thomas S. Baldwin, the aeronaut and gymnast, connected with the ballooning department of the signal service and war departments, has been ordered to Boston, where he will conduct a series of interesting and important experiments in aeronautics. Vessels approaching Boston can be heard through their fog horns 15 miles out at sea, but when within three miles off shore the sound of the fog horn whistle is absolutely lost. The question is, where does the sound go? It is proposed to investigate the upper atmosphere at a distance of 3,000 feet in the hopes of ascertaining whether the sounds from the whistles and fog horns do not go upward, as Mr. Baldwin believes such sounds do. A monster balloon will be anchored to a government vessel, and will be allowed to ascend to any required distance by means of a wire cable worked by steam. The vessel will cruse about off Boston and neighboring points to a distance of 10 or 15 miles, and sounds will be made from whistles and horns. 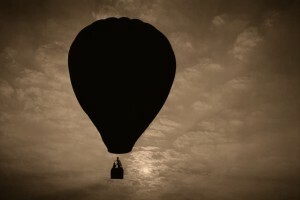 When within three or four miles of shore it is believed that the aeronaut in the balloon can ascertain whether the sound in getting lost ascends. In the coil of wire that is attached to the balloon is a telephone wire, by means of which Baldwin will communicate with officials on board the ship. Major Livermore, of the government service with his staff, will assist the aeronaut in his work, which will probably occupy some months, and perhaps a year. After these experiments are concluded, Baldwin will turn his attention to experiments in war ballooning, for the benefit of the War Department. The following newspaper article appeared in The Salt Lake Tribune, (Utah), on August 15, 1909, page 20. It is unclear if the Massachusetts Volunteer Balloon Corps ever came to fruition. BOSTON, Aug. 14. 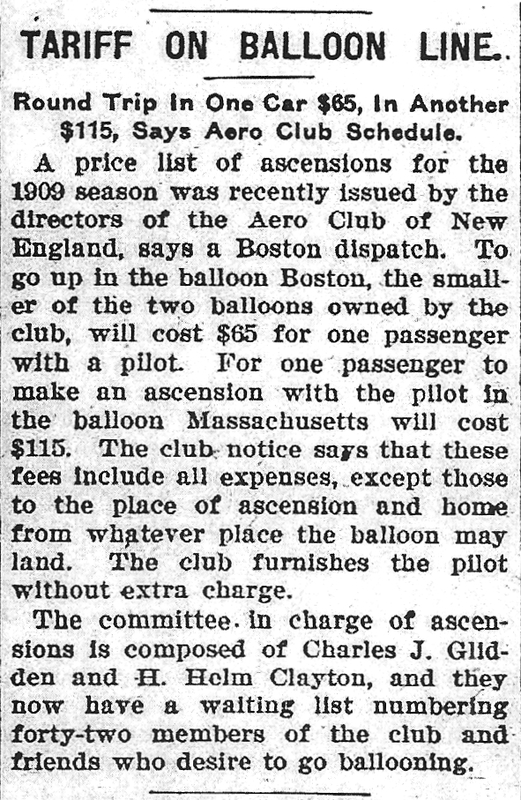 – Massachusetts is to have the first “volunteer balloon corps” in the world, according to the announcement made today by Charles J. Glidden, the well known aeronaut and automobilist who is now making plans for organizing the aeronautic corps this fall. Recognition from the state militia will be sought. The volunteer corps will consist of men of prominence, who are interested in aeronautics, and will be made up of two divisions, pilot and meteorological. The pilot division will include the leading balloonists now making ascensions in Massachusetts for pleasure. Those who have been invited to join the meteorological are Prof. W. Pickering, and Prof. A. Lawrence Rotch of Harvard, Prof. David Todd of Amherst, and Prof. Helm Clayton, formerly of the Blue Hill Observatory. On Tuesday, September 16, 1909, the balloon “Massachusetts” made an ascension from Pittsfield, Mass., and while more than 7,000 feet in the air became the first balloon in aviation history to have a Masonic meeting conducted in its basket. The Massachusetts was owned by the Aero Club of New England. The following article appeared in the Essex County Herald, (of Guildhall, Vermont) on September 24, 1909. The following article appeared in the Evening Star, (Washington, D. C. ), on September 25, 1909, page 3. “The latest in the way of novelty is the institution of a Masonic lodge in a balloon more than a mile in the air. 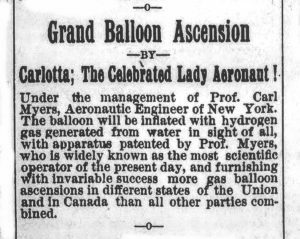 This happened at or near Pittsfield, Mass., recently, when Aerial Lodge A. F. & A. M., was instituted in the balloon Massachusetts at an elevation of more than 7,000 feet, this being the first meeting of the kind ever held. The lodge was conducted with all Masonic observances possible under the conditions. J. J. Van Valkenburg of South Framingham was worshipful master; Jay B. Benton of Winchester was senior warden, and Charles J. Glidden of Boston junior warden. The Masonic ceremony was the chief feature of a short but most interesting aerial journey, the details of which were recounted when the party descended at Greenfield, Mass., after considerable difficulty in getting the huge gas bag and its numerous trappings out of the forest. The Rockville Collegiate Balloon School was established in September of 1917 by William and Francis Maxwell as a training school for perspective army observation balloon pilots. Rockville is a village within the town of Vernon, Connecticut, however, the school was actually located in the former Windermere factory building in the neighboring town of Ellington. The school was set up to train up to 100 students at a time. During preliminary study, cadets were paid $33 a month, which included food, clothing, and a place to sleep. After two months of courses, they were sent to training camps to continue their studies, during which time they would be paid $100 per month. Upon graduation they would be commissioned lieutenants in the U.S. Army Signal Corps and receive $2,000 per year. The school was administered by Everard Thompson. The Chief Pilot was Nason Henry Arnold, who held pilot license #14 with the Aero Club of America. Nason had been flying balloons for fourteen years, and had participated in the International Balloon Race held in Germany in 1908. Another instructor known to have taught at the school was Walter Jewell. Three students known to have attended the school are; E. H. Millikan, E. L. Taylor, and W. S. Sweeney. The first balloon ascension from the school took place on September 11, 1917, when a balloon containing Nason H. Arnold and Walter Jewell reached an altitude of 6,500 feet as it drifted over the town of Willimantic and beyond. The balloon came down on the farm of Joseph Nosal, located in Windham near the Lebanon town line. The second flight took place two days later on September 13, and nearly ended in disaster. This ascension involved one of the school’s largest balloons, the 80,ooo cubic foot America II, which had once flown over Europe from Paris, France, to Berlin, Germany. The balloon left Rockville at 8:45 a.m. with six persons aboard. There was the pilot, Nason Arnold, and his assistant pilot, Walter Jewell, as well as William and Francis Maxwell, and two students, Edward Lee Taylor and his brother William Sloan Taylor. They landed safely near Vernon Center, where the Maxwell brothers got out and two others took their place. The balloon then ascended for the second time that day and was carried off by a gentle breeze, but wound up crashing into some treetops near the town of Coventry, the jolt of which severed the netting holding the huge gas bag, which broke loose and floated away on its own, leaving the passengers and gondola stuck at the top of a tree. Apparently someone had seen the balloon make its unexpected plunge, for rumors of a severe if not fatal accident quickly circulated sending people rushing into the area. Fortunately, such was not the case, and all injuries were minor. The run-away balloon was recovered about seven miles away. About a week later, the balloon Cleveland ascended with Nason Arnold, student E. L. Taylor, and a cameraman identified as W. F. Bergstron of Hartford, Connecticut. Bergstron worked for the Mutual Film Corporation, and it was his job to film the ascension from the point of view of the occupants of the balloon to be used for lecture purposes at the school. The Cleveland rose to 5,200 feet as it passed over Willimantic, and landed safely in the town of Hampton, 35 miles from its starting point. On October 18, Nason Arnold made an ascension with Congressman John Q. Tilson, a member of the House Committee on Military Affairs. After a three hour flight the balloon landed at Long Meadow, Massachusetts. On October 24, 1917, a balloon from the Rockville Collegiate Balloon School made an ascension in Springfield, Massachusetts as part of the Liberty Loan Campaign. Air Service Journal, September 6, 1917, Page 277. On July 5, 1858, John La Mountain made a balloon ascension from Rutland, Vermont, and reportedly reached an altitude of five miles – a remarkable feat for the day. The following is an excerpt from The Middlebury Register, of Middlebury, Vermont, dated July 4, 1858. The trip lasted one hour and twenty-two minutes during which the balloon traveled forty miles before it landed in the town of Windham. Professor Washington Harrison Donaldson, (1840-1875) was a Balloonist from reading, Pennsylvania, known for making numerous ascensions during his career. What was perhaps his most infamous ascension occurred on October 7, 1873, when he left New York on what was to be a transatlantic flight to England, but was forced down in New England instead. What makes this flight by Donaldson historic is that it was the first known attempt by an aeronaut to cross the Atlantic Ocean by air. Since the first balloon flight in France in 1793, it had been every aeronaut’s ambition to be the first to cross the Atlantic Ocean by air, yet each knew that such a trip in a balloon was impossible, for once aloft a balloon was at the mercy of prevailing winds. Then in 1843, an aeronaut named Professor John Wise came to the conclusion that such a trip was feasible if the balloon could reach a certain altitude where he believed there was a constant flow of air blowing from west to east. If a balloon could reach that current of air, he speculated, it could easily cross the ocean. Professor Wise petitioned Congress for money to develop his idea and to build a balloon, but he was turned down. 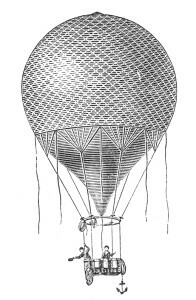 Professor Donaldson made his first balloon ascension from Reading, Pennsylvania, on August 30, 1871. Within a year he’d established his reputation as an aeronaut and began to develop plans to build a balloon with which to attempt a trans-Atlantic trip to England utilizing the air currents Professor Wise believed existed. Initially Donaldson approached Boston municipal authorities asking for funds with which to build his balloon, and offered to begin his historic trip from that city, but was turned down. Undaunted, he went to New York, and received funding from the Daily Graphic newspaper. 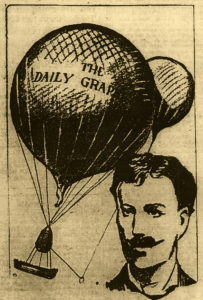 Thus, Donaldson’s balloon was christened, “The Daily Graphic”. Donaldson’s balloon was massive, holding 300,000 square feed of gas, beneath which hung a life boat for use in the event of a water landing that was stocked with enough provisions to last forty days. The balloon took off from the Capitolino Grounds in Brooklyn, New York, at 9:19 a.m. on the morning of October 7th. Accompanying Professor Donaldson on his trans-Atlantic journey were Alfred Ford, and George Ashton Lunt. When the balloon reached about 5,000 feet prevailing winds began pushing it eastward, and then to the northeast carrying them over Westchester County, New York, and then over Connecticut. At about 1:15 p.m. they passed over a mountain in Litchfield County Connecticut and found themselves above a valley surrounded by thick clouds, heavy rain, and gusty winds. The storm was a violent one with strong winds spinning and buffeting the craft. Then the balloon was caught in an updraft taking it high into the sky before it suddenly began falling back towards earth at great speed. It descended to tree- top level, and was pulled across the tree tops about 30 feet off the ground. At this point the men decided to abandon the balloon and jump. Donaldson and Ford leapt at the same moment, but Lunt was delayed. The sudden loss of weight caused the balloon to suddenly shoot skyward again taking Lunt with it. Before long it disappeared back into the storm clouds. Donaldson and Ford alighted on the farm of Charles Lewis in North Canaan, Connecticut, relatively unhurt. At this point there was nothing they cold do for Lunt. In his statement to the press Lunt later recalled his experience: “We were attacked by a tremendous squall of wind and rain at fifteen minutes past one o’clock, and were driven near the earth with frightful velocity. Everything was thrown overboard without avail, and as we were dashed to the earth Donaldson and Ford sprang out, and the balloon shot into the air, bearing me with it, and was speedily in the storm-cloud again, and being whirled about in the most alarming manner. I shouted to Donaldson for directions but could hear no reply, and was left to my own resources, The bag was shaking above me with awful force, and I could see nothing, so thick was the cloud. I seized the valve cord and attempted to open it. Could not open it. The cord became entangled with the neck. Suddenly tree tops shot up through the fog, and in an instant the balloon was whirling through branches. I climbed out of the boat to a place above the ring, and as the balloon rushed into a thicket of trees I swung myself out and dropped among the branches. The balloon was later recovered in a severely battered condition about a mile from the Lewis farm . Professor Donaldson was later lost in a balloon ascension from Chicago over Lake Michigan in 1875. Neither he nor his balloon were recovered. An interesting newspaper article relating to the missing Professor Donaldson appeared in The Morning Herald, (Wilmington, Del.) on December 22, 1876. Originally published in The Smithfield Times, (Rhode Island), June, 2016. 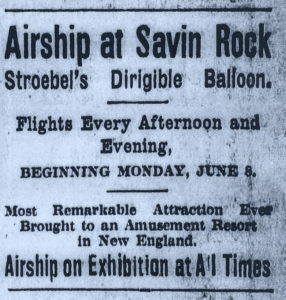 Some of the early aerial weddings mentioned in this article took place in New England. There’s an old joke about a woman who told her suitor that no man on earth was good enough for her to marry. Undaunted, the hopeful groom suggested that instead of getting married “on earth”, they get married in a balloon. Various renditions of this quip have appeared in old newspapers, and at the dawn of the 20th century it was considered not only humorous, but timely as well, for balloon weddings were, (Dare I say it?) on the rise – so to speak. 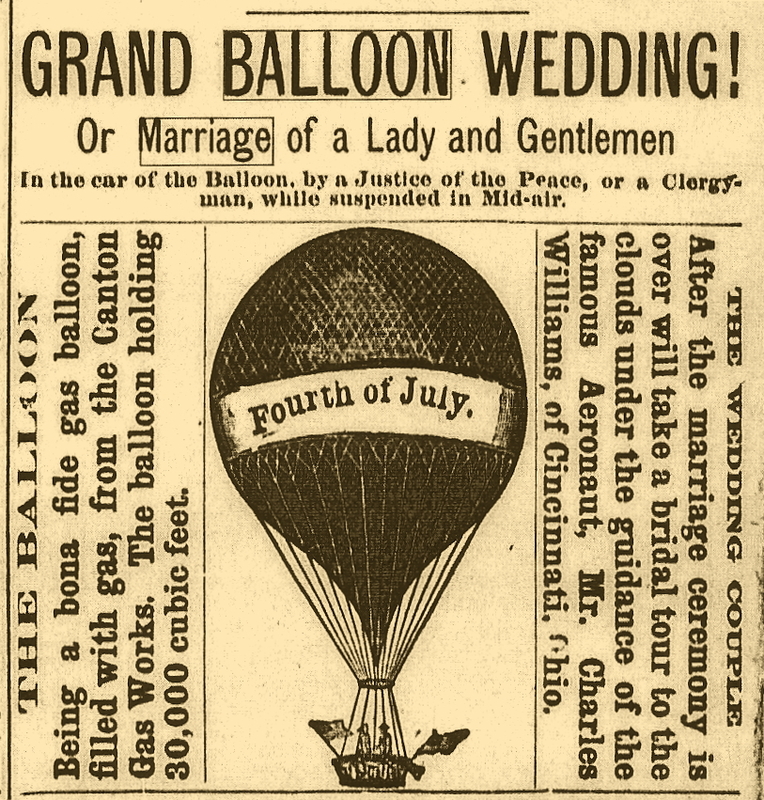 For as long as people have been getting married there’ve been those wanting to take their vows in non-traditional settings, and by the later half of the 1800s balloon technology had “risen” (Pun intended.) to the point where something new in the way of unique circumstances could be offered – aerial weddings. The following stories have been culled from various newspaper articles. Famous showman and circus owner P. T. Barnum is generally credited with orchestrating the first aerial wedding in history which occurred in Cincinnati, Ohio, on October 19, 1874, when Charles Colton and Mary Walsh were married in a balloon one mile above the earth. The event created quite a sensation at the time. However, there’s evidence to indicate that this marriage in the clouds may not have been the first. John Kinney, the owner of the balloon, saw the potential business opportunities in aerial nuptials, and announced shortly afterwards his plans for constructing a new balloon specifically for weddings which was to be christened the Maggie Fornshell. Another early balloon wedding may have taken place in San Francisco, in November of 1873. It was announced in the Pioche Daily Record that Professor A. A. Lay had obtained a marriage license for himself and one Miss Mary Smith so they could be married in a balloon 900 feet above San Francisco’s city gardens by Justice of the Peace C. F. Townsend. It was reported that once the vows had been exchanged the balloon would be brought down for the reception. What may have been the first wedding involving a balloon took place in New York City, on November 8, 1865. The event was advertised by promoters as the “Balloon Nuptial Ceremonies”, and thousands bought tickets to see the “show”. 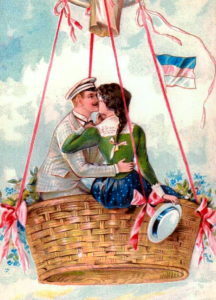 John N. Boynton, of Syracuse, New York, was to be married in a balloon while it sailed aloft to Miss Mary West Jenkins of St. Louis, Missouri, but instead the vows were exchanged before they climbed into the gondola. Had they only stood inside the basket and risen even three feet from the ground they could have made wedding history, and scooped P.T. Barnum by nine years. 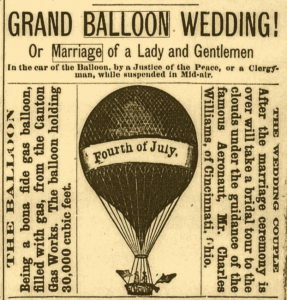 Barnum was an advertising genius, so it’s no surprise that after his sponsored airborne wedding of 1874, balloon marriages “took off” (Pun intended.) as more happy couples took their love to “new heights” – sometimes with mixed results. 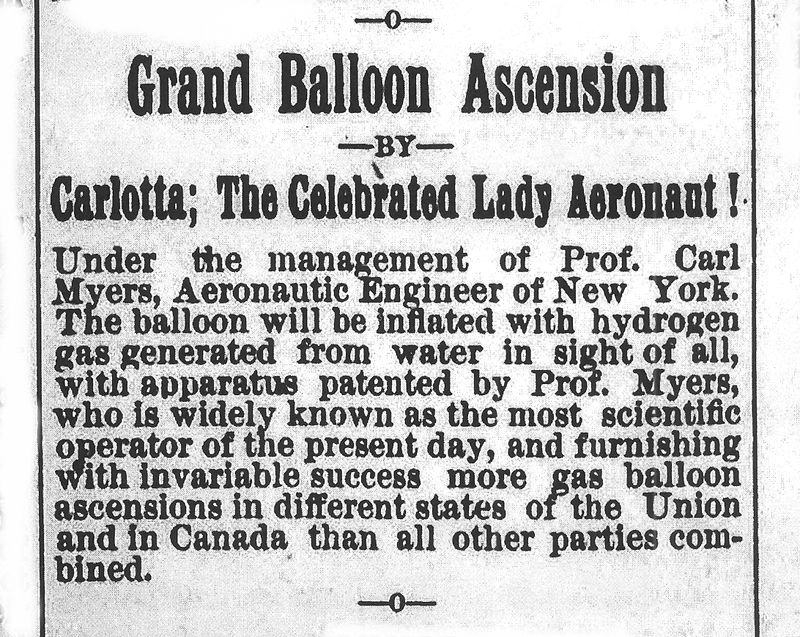 The 19th century was a time when people flocked to events involving balloon ascensions much to the delight of those who rang cash registers at country fairs and other locations where balloons were exhibited. Advertised balloon marriages drew even larger crowds due to the increased novelty. But getting married in a swaying balloon in an era when manned flight was still relatively new was not for the faint of heart, or those who suffered from a fear of heights. An interesting case of “cold feet” took place at Allegheny City, Pennsylvania, in 1884, when the bride and groom failed to arrive for their appointed wedding, leaving promoters with the prospect of refunding thousands of dollars to the waiting crowds. Yet, as they say, “the show must go on,” so the balloon’s owner and his lovely assistant posed as the happy couple and were married under assumed names. Four years later the owner found himself in court, for evidently the fake marriage had legally binding implications. The “marriage” was dissolved by the judge. Then there was the couple from Providence, Rhode Island, who in 1902 were married in a balloon to win a bet. Thomas L. Bennett was already engaged to Edith Ring when a friend bet him twenty-five dollars that he wouldn’t get married in a balloon. The couple accepted the challenge and was married one mile above the Tioga, Pennsylvania, fairgrounds. In 1888, Edward T. Davis and Margaret A. Buckley were married in a balloon before 30,000 people at Narragansett Park, in Providence. After the vows were exchanged the balloon sailed off toward Massachusetts where it encountered a storm and went down in a swamp. Fortunately all aboard were rescued safely. A Chattanooga, Tennessee, couple got married in a balloon on June 28, 1897. Shortly after the vows were exchanged, they found themselves drifting over the Tennessee River, where the bride became frightened and jumped from a height of one-hundred feet into the water. The Groom waited until the Balloon had risen to 1,000 feet before jumping with a parachute. Neither was injured. In another case, what began as a balloon flight ended as a marriage. On July 17, 1909, Dr. Sidney S. Stowell met Miss Blanch Edith Hulse for the first time at the Pittsfield (Mass.) Aero Park, and dared her to make a flight with him in his balloon. The pretty woman accepted, and before long the couple was sailing two miles above the earth. By the time they landed at Shelbourne Falls, Massachusetts, about fifty miles away, love had blossomed. They were married a year-and-a-half later. Another 1909 balloon wedding connected to the Pittsfield Aero Park was the marriage between Roger N. Burnham, a Boston sculptor, and Miss Eleanor H. Waring, a writer from Brookline, Mass. They were married in Falmouth, Massachusetts, before heading to Pittsfield to begin their honeymoon journey in the large balloon, “Pittsfield”, piloted by William van Sleet. One problem with aerial weddings was the fact that the exchange of vows could only be heard by those aboard the balloon, leaving guests on the ground more or less unfulfilled as spectators. In the summer of 1909 one couple solved this difficulty by incorporating modern wireless technology. The event took place high above Seattle, where the young couple said their vows via wireless radio The ceremony was conducted by a minister who stood on the ground next to the radio operator surrounded by the wedding party. Once they were pronounced man and wife, the groom landed the balloon amidst cheers and congratulations. 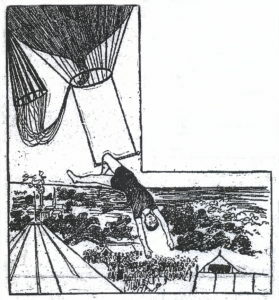 In 1913, a balloon ascension was advertised for the county fair in Rutland, Vermont, and promoters offered twenty-five dollars for a couple willing to be married in the balloon while it was in flight. The offer led a local religious leader to preach against “mercenary marriages”. The invention of the “aeroplane” offered another way to get married aloft, but initially being wedded in one was difficult, for very few were capable of carrying four people; the bride and groom, pilot, and minister. However, this didn’t stop couples from being married while sitting in an aeroplane that was firmly on the ground, which still made them eligible to say they were married “aboard” an aeroplane. Newspaper articles as early as 1911 mention couples being married “in” or “aboard” aeroplanes, therefore it’s difficult to determine exactly when the first wedding aboard an airplane in flight took place. By the 1920s airplane technology had come a long way. In 1922 a New York couple was married in a plane over Mineola, Long Island. Afterwards they honeymooned in New England. What is reportedly the “first marriage in an airplane on record in the State of Vermont” took place on August 26, 1927, over the Milton Airdrome. As their airplane circled 2,800 feet overhead, Kenneth Dickerman and Sadie Branch were married by the Reverend S. Rowe who broadcast to the couple from the ground via radio. As the couple exchanged their vows, the pilot cut the engine and allowed the plane to glide downward so wedding guests and spectators could clearly hear the broadcast words. Three years later on April 20, 1930, Rhode Island saw its first airplane wedding. Mabel P. Denver of Seekonk, Massachusetts, and Charles E. Cherry of Pawtucket, Rhode Island, were married in a tri-motor aircraft as it soared above What Cheer Airport in Pawtucket during an air meet. Then there was the New Hampshire couple who met by accident – literally – when the groom, a pilot, was injured in a plane crash at Concord Airport. At the hospital he met and fell in love with his nurse. They were married August 28, 1936, and took off in an airplane to begin their “aerial honeymoon”. Getting back to P.T. Barnum’s sponsored wedding of 1874; some may have suspected it was nothing more than a publicity stunt. After all, Barnum was known for stunts and hoaxes, and the newlyweds were employees of the circus. In fact, in July of 1875 some newspapers were reporting that the marriage lasted but three weeks however, such is not the case. A 1901 newspaper account from the Lewiston Evening Journal proves the marriage was not only legitimate, but a success. In that article, Charles Colton, then known as Sergeant Colton of the New York City Police Department, recalled how the wedding might not have occurred had it not been for his wife Mary’s initiative. Both had hoped to marry, but financial circumstances were forcing them to wait. Then Mary suggested they be married in a balloon. They approached Mr. Barnum who liked the idea, and gave them a substantial dowry with which to begin married life together. People are still being married in balloons and airplanes today, and pay big money to do so, although the novelty is hardly newsworthy any more. Yet the world is still waiting for the first wedding in outer space. (OR.) East Oregonian, Balloon Trip The Cause”, January 5, 1911, evening edition, page 5. At 1:30 p.m., on November 29, 1910, the balloon Cleveland ascended from Pittsfield, Massachusetts with four men aboard. There was the pilot, A. L. Stevens, and with him were three passengers, L. M. Taylor, M. M. Morris, both of New York City, and S. F. Beckwith, of Garrison, N.Y. The balloon drifted westward and passed from Massachusetts to New York. While over the Hudson River the aeronauts encountered a blinding snowstorm. As if that wasn’t perilous enough, a huge flock of geese, estimated by the men to contain a thousand birds, suddenly encountered the balloon and began bumping and scraping against it, threatening to put holes in the fabric. The birds began to panic, for the swirling wind left them as helpless as the airmen, and for nearly an hour the flock surrounded the balloon honking and squawking the whole time. At one point a goose crashed into the men in the basket, where one of them captured it. The ordeal ended almost as suddenly as it began and the balloon landed in the town of Amenia, New York, at 5:45 p.m., 44 miles from Pittsfield. 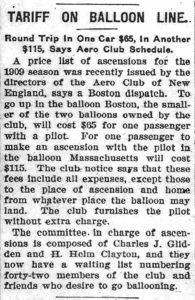 Boston Evening Transcript, “Ballooning in 1910”, by William Carroll Hill, January 4, 1910. On May 21, 1910, the following small news item appeared in the Rock Island Argus, a newspaper in Rock Island, Illinois.